Almost everybody, young or old, has experienced knee pain like pins and needles at some point. It could have been after a long walk, a hard run, some heavy lifting. Knee pain manifests itself in different ways from clicking and cracking sounds when folding your legs to swelling as if muscles are being pulled when you bend and stand up. However, knee pain that feels like pins and needles is often the most unsettling for many patients. Depending on your pain tolerance, the feeling of pins and needles in the knee can simply be dismissed or can be really bothersome. However, this sensation should never be ignored especially if it has lingered on for some time. It can be a symptom of something serious, also referred to as “paranesthesia”. People who experience paranesthesia should be on the lookout as it is a sign of nerve compression. Nerve compression occurs in places of our body that go through repetitive motions. They also take place when a body part is made to hold one position for long periods. The knees make continuous sudden movements like running, jumping, and lifting. Or when we bend and squat then hold the pose. 1. Genetics – Some people are just born unlucky with their knees. It could be they have smaller tunnel sizes for the nerves and these get even worse as with age. 2. Previous injury – People whose knees are constantly subjected to stress, wear and tear, are likely to experience nerve compression. Athletes, for example, tend to injure their knees more often as they play, and these injuries will eventually lead to nerves getting pinched. 3. Genetic and metabolic diseases – There are a number of diseases that not only exhibit themselves with nerve compression but will often intensify the sensation, these include diabetes, rheumatoid arthritis, hypothyroidism, and acromegaly. The best way to treat nerve compression and reduce associated symptoms is to zero in and single out the cause. Your doctor may recommend x-rays to rule out bone fractures, ultrasound, MRI and also blood tests. Knee pain from nerve compression due to diseases are often (not always) treated with anti-inflammatory drugs. Rest coupled with warm/cold compress is always a good way to rehab the knee. When the pins and needles have reduced to manageable levels, you can now start with strengthening and conditioning exercises not just to make your knee stronger, but also the surrounding muscles which will reduce the stress to the knee. 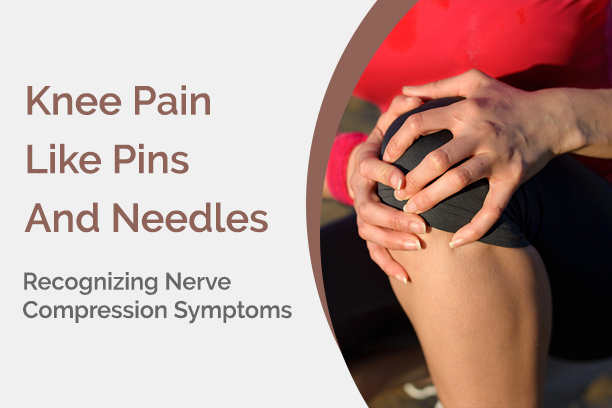 Do not let pins and needles from nerve compression hold you back! Give us a call and find out how to overcome the pain, treat your knees, and live a pain free, active life!